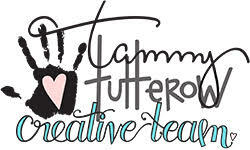 I have a card today using a brand new Tammy Tutterow cling stamp! Wait until you see this newest release - it is spring to the max!! 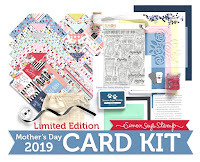 Wouldn't this be perfect for Mother's Day, or for any special lady's birthday? 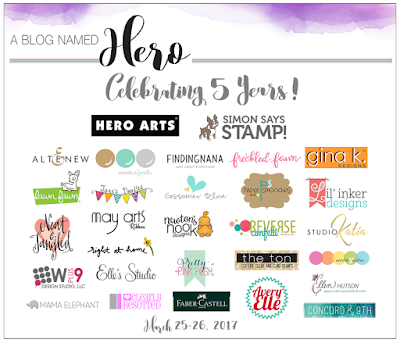 Such an easy design - stamp, color, and layer; nice and flat for mailing, and you don't need to add a sentiment - everything is built right in! 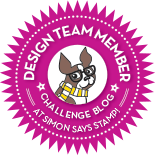 Be sure to visit Tammy's blog to see what my team-mates did this time! 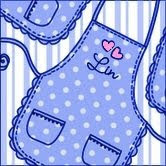 Our theme this week is the ever-popular Anything Goes, and the design team are all playing with Stampendous products. I made 2 cards for you today, both of them flowers and both of them in shades of purple. Lilacs are probably my favorite flower, so when I saw this cling set, I jumped! We always had lilac bushes growing up, and they bring back fond memories of home. I colored these a pinky purple to mimic a transplant that my Dad gave us, and fussy-cut my flower and leaves, then glued the leaves over my stencilled panel and popped the flower up a bit with foam squares - I like the dimension. My 2nd card uses a Stampendous set I got a few years ago, which is one of my favorites because of all the different flowers that are in it, along with 2 jars/vases to put them in! I think the flowers that I used today look like spring violets, and I love seeing them in this canning jar, also in the set. And I love how they look mixed with the gingham! The kits have been selling out quickly each month, so if you want to be assured not to miss any of the upcoming ones, go HERE to automatically subscribe. You'll save yourself $5.00 each month, and will never have to worry about missing another kit! 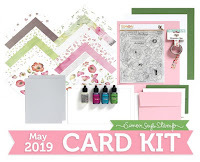 Our theme this week is "More than One Die or Punch", and my teamies and I are playing with Memory Box products! After cutting each of my dies, I left them in the scrap of cardstock and watercolored them, using an ombre effect on the sentiment. Then I popped them out and attached them to my stitched rectangle. The tiny hearts are pop-outs from the wreath. For this one, I cut the butterfly 3 times, from black, sunshine, and orange peel cardstocks. I fussy cut the black one out, attached it to my white background, and then paper-pieced the gold and orange details into it. I also framed the panel with the same colors, using 2 other sizes of the pinpoint rectangle dies. To finish I added a sentiment banner embossed in white on black. 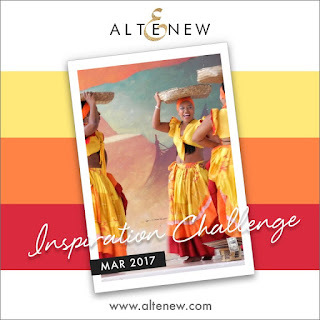 My friend Virginia is now on Altenew's Design Team and she is hosting this month's Inspiration Challenge there! I turned once again to my favorite Altenew flower set and used Virginia's colors. I love these bright colors - and it's a fun change from my usual pastels. I thought this sentiment was the perfect one to go with them, as was the wonky stitches framing; sprinkling on lots of sequins reinforces the celebration theme, too. I didn't plan it this way, but this looks like a shot from above of these lovely ladies dancing! And, since flowers are my favorite motif, I'm also entering my card into The Flower Challenge. 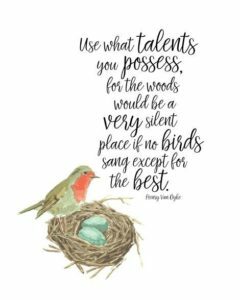 With a nod to the upcoming St. Patrick's Day, our theme this week is "A Bit o' Green", and the design team are using Taylored Expressions products; if you have any of their products, we'd love you to use them, too, but it isn't a requirement to enter. I used a bit of green and a whole lot of green for my cards this week! My first card features a Taylored Expressions cutting plate, to make a spring-feeling woodland card. I mixed 3 distress inks for my background spring green. I cut my birch trees from music dp; I think this gives a more spring-like feel than stark white cardstock. Then I sponged my 3 distress inks randomly onto a white cardstock panel and lightly spritzed it with water. I sponged only mowed lawn onto a 2nd cardstock scrap, spritzed again, die-cut the top edge with a Snow Drifts die, and stamped my sentiment. These 3 panels were then layered onto the card base. My little fawns were stamped on a light kraft cardstock and colored with markers before fussy-cutting them and placing on the card. I was tickled to use them because they were designed by our teamie Caryn! Here's a card I made with the stamp set that I received from Simon's New Beginnings release. And I used my distress oxide inks again! I had a leftover background panel that I had pulled through some smooshed and spritzed oxide inks. So I stamped these big flowers over various areas, and cut them out. After stamping my sentiment, and arranging my flowers, I removed them and stamped just one of the leaves that are in this set, then watercolored them with the cracked pistachio. You can see how much paler this color becomes when used this way. The flower that I used here is the largest from this new set - it has 2 other flowers, 1 in 2 sizes, plus various details, leaves, and berries in it. I look forward to playing with it again! I'd like to enter this into this month's The Flower Challenge. I'm back today with a card using another of Tammy Tutterow's terrific products. After coloring the design, pulling the colors from the backing heart paper, I stamped just the heart onto a scrap of coordinating design paper, cut it out, and then popped it above the rest of the card. I first made my background, layering on the colors after smooshing them onto a craft sheet and spritzing them with water. I heated the panel after every pass-through of the colors, and added water each time. When I was happy with the results, and sure that my panel was dry, I stamped and white embossed the pretty swirly design, adding my stamped and die-cut sentiment, along with some sequins for sparkle. Again, after stamping, I lightly spritzed the panel, and the colors became more intense. I didn't think I needed these new inks, but after playing with just these 3 colors, I'm sold! I love the soft feel that results. My next choices will be orange marmalade, fossilized amber, and worn lipstick. 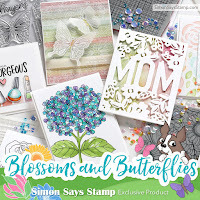 Have you seen the new release at Simon Says Stamp? 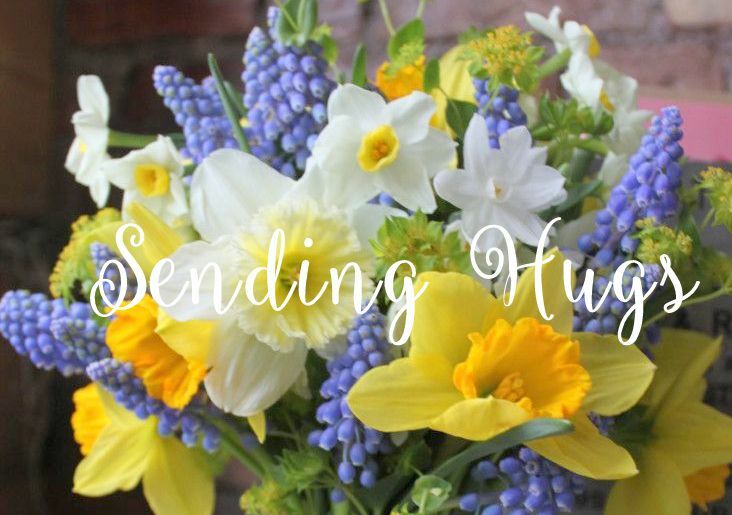 I'm swooning over so many of these amazing new products that will help us celebrate Spring!! My favorites? 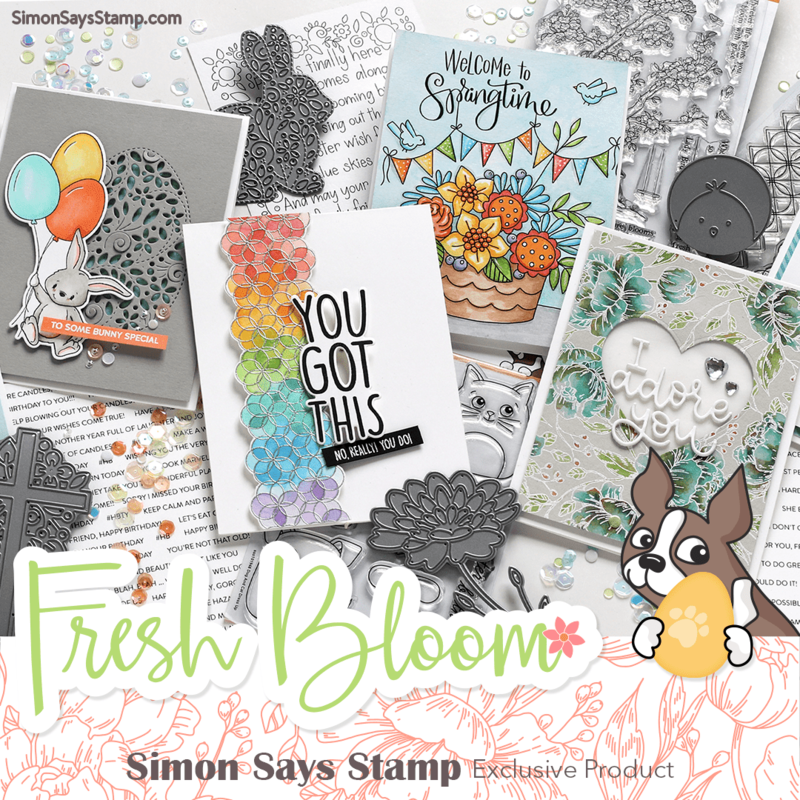 More Spring Flowers stamps and dies, Suzy's In Full Bloom watercolor panels, Hope Blooms stamps, and the new inks! 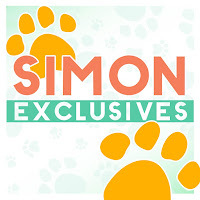 There will be a blog hop tomorrow beginning at the Simon Blog, to show off these gorgeous new products - I'll see you there! Our theme this week is "For a Special Lady", and the team are highlighting Penny Black products. Since there is a lot of black details in the outlines of this stamp, I framed the panel and stamped the sentiment on black. Next up, put on your sunglasses, I used fluorescent markers for this next one. 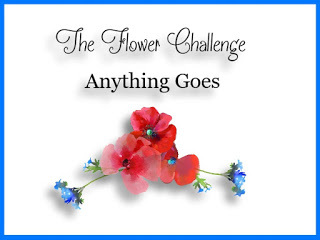 The challenge this time at the new Flower Challenge is Anything Goes. I love these challenges where I am not limited to products, so I pulled out an old but retired favorite. I was inspired by an episode of HGTV: a grey couch that had pillows of purples and blues. I don't think I've ever used a grey background, but it's a nice change, isn't it? This set includes an outline stamp plus a stamp that will add color to the inner petals of the flower. Since they were mounted against a grey background instead of my usual white, I wanted to color in the remainder of the petals. Because these Altenew inks are water-based, I was able to squiggle them on an acrylic block, spritz them with water, and use them to color in the outer petals. I saw that the current Card Concept challenge is Lime & Aqua, 2 of my favorite colors! Gingham and these painted flowers are dear to my heart, and I think they make a sweet pairing! 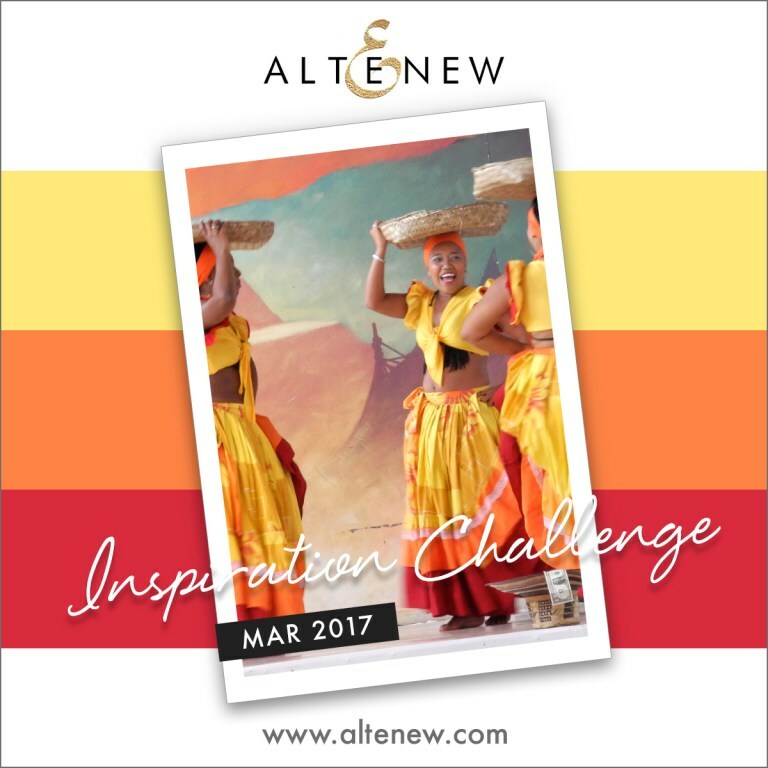 I'm guessing that this style is Clean & Layered, but I'm never sure......I hope that one of the ladies at the challenge will set me straight. Here's my addition to Tammy's Five for Friday feature today. I stamped the flower swag twice, then watercolored and cut them out and attached them at opposite corners of the line border frame, leaving enough space to stamp my sentiment between them. The line border frame is one of those stamps that will be invaluable, I think - it doesn't take away from a design, but can be used as a fun accent! Tammy has a more ornate frame coming soon - see it here. Our theme this week is "Tag, You're It! ", and we're playing with Ranger products. Making tags has really grown on me, and I enjoyed making 2 tags today for this challenge, both of them featuring some lovely butterfly dies. This first one uses a Tim Holtz stencil and distress inks for its background. And for the second one, I used an embossing folder to make my background, and some much softer colors. To make this background, I first embossed my tag in the folder, then I lightly stroked a spun sugar ink pad across the raised (floral) surface. Next I put the tag back into my folder, inked the top of the folder in mowed lawn, then closed the folder and ran it through my cuttlebug again. Despite being careful to line up the tag during this step, it evidently moved a tiny bit, and gave this effect that allows part of the manila color to show through. I'll probably never be able to achieve the same effect! But for that reason, I chose to use the same manila to cut my butterflies. I love the garden effect this tag has, and chose these words for my sentiment - don't our gardens reflect our dreams?